When I have finished painting for the day, I scrape up unused paint and put it in a jar with a little bit of water. Some times it turns out to be mud, but sometimes it's not too bad. I decided to cover a canvas which I had used to practice brush strokes on, and using my left overs, I ended up with a fairly good green which covered well. 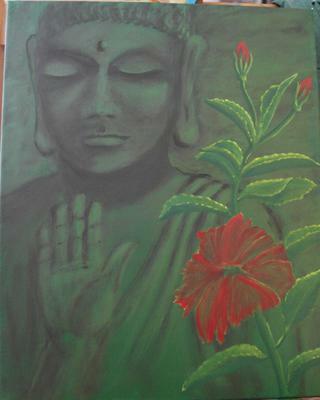 Had no idea what to paint so I started dabbling with burnt umber and ended up with a Buddha. I then decided to leave him rough, but to put in a hibiscus flower and leaves which will have more detail. Not finished yet but I had to submit something so that Frankie wouldn't hassle me...watch this space. I think it is so interesting just as it is. I wouldn't touch a thing it would just lose something if you added anything. Lovely painting ... and a happy accident with the left over paint. I like its simplicity and the juxtaposition of the hot red flower interacting with the cool green. Can't wait to see what else you do with this one! Sorry to hassle you, but you gotta admit, it's a little bit fun! You never know who's watching too.